MONUMENTAL DRUMS VIRTUAL INSTRUMENT AND SAMPLER is the answer to your Blockbuster movie Drum and Percussion needs. Monumental Drums provides a huge collection collection of original percussion composition music loops and individual one shot drums, including full banks of drums recorded to real analog tape! Monumental Drums caters to the needs of musicians who create film scores and trailer music, providing the perfect larger-than-life complement for any music genre. 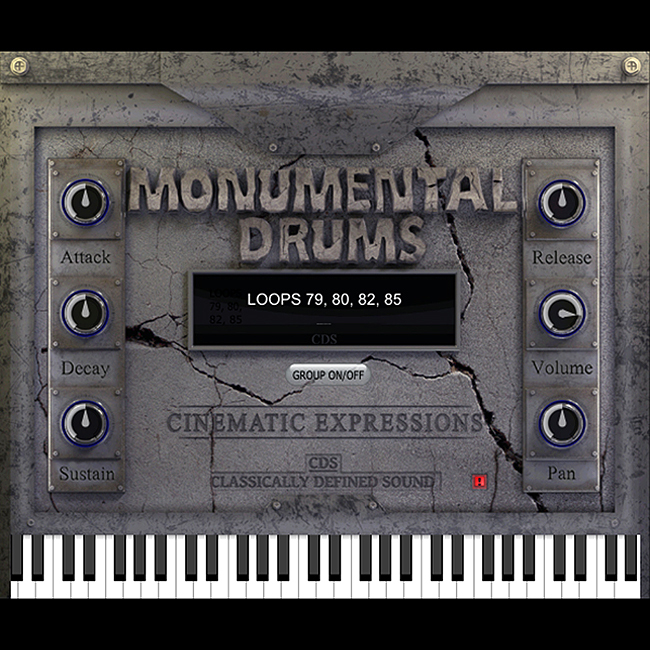 Monumental Drums is the second in our series of Virtual Instruments and Samplers called "Cinematic Expressions". Each new product in this line focuses on a specific genre or specific task. Audio samples are created using nothing but sounds in this sampler. These mixes use no additional processing, effects, or mixing tools, thus are taken 'dry' straight out of the sampler. Important information on purchasing! If you do not have a PayPal account, you can still purchase this library with your credit card without having to become a PayPal member. Copyright ©CDSoundMaster All Rights Reserved.